This is to notify all, that we will be decommissioning http://riaforge.org/ (“Site”) soon. This decision has been taken due to business reasons. If you are interested in reviewing or downloading any project or files available at Site, please do so, by April 16, 2019, 12 noon PST, as per license terms associated therewith. Past that, you will not be able to access the projects or files. Should you have any concerns/suggestions/query, feel free to contact us. We also suggest that individual project owners move their respective projects to their individual accounts on a repository hosting service such as Github, if they have not already done so. According to the RIAForge website, the last date/time to access its projects is Noon PST tomorrow (4/16/19). Has there been a resolution on the matter of the project code repositories? The hole in the Adobe CF Builder 2018 Welcome Screen is a small but significant part of the impact of this loss, and so while I’m personally not depending on its existence, I’m curious from a historical perspective whether or not the code will live on elsewhere. Thanks to folks who have posted various suggestions on the way forward. Unfortunately, transferring the ownership of RIAForge to some other entity/person other than Adobe is not an option here. In fact, this is the first thing we checked. I had even reached out to Pete Freitag asking him if he was interested in managing this site going forward for the community. We cannot do so because the repositories were shared by project owners to us with associated licenses. We cannot transfer the ownership of such a repository to a third party. To create a new repository(community maintained or otherwise) the project owners should be willing to share their corresponding projects again to that new repository. That is the only way forward. The problem is with projects where the project owners have moved on, and who therefore won’t bother. And since nearly all the projects use the Apache open source license, those motivated to move things to a new repo could seemingly do so on their own. But to be clear, my goal was to be able for you to provide access to the resources “from the backend” to facilitate that, rather than forcing them to have to screenscrape everything. If others may be motivated to take on that task, perhaps some code will be saved. Otherwise, it will be lost. Some may argue that “at least we’ll have the archive.org wayback machine”, and that’s true–until the domain registration lapses and some scammer buys it, and puts in a robots.txt, and then archive.org will also stop access to the archive of the site. Could anyone from Adobe step in with any comment on the various offers below? The clock is indeed ticking. Another great idea, Brad. As for redirecting, though, would you think you’d capture all the historical info currently in RF? I’d suspect not–and I’d understand deciding it’s not worth the bother. Just asking if it’s been considered (by those discussing a proposed move to FB. It’s certainly better than it all just going away, if none of the other options proposed so far were taken. 🙂 And anything is better than it just going away, of course. What user would we associate the projects with? Do we auto-create users for them or is that too much? Would Adobe even give us the DB? Would we have permission to post people’s project without an explicit consent? MANY of the download links are dead. Do we try and track those down, or just give up on them? OK, thanks, and glad to hear of that discussion. Hope you may get answers from Adobe, if they’ll consider that (or indeed any) idea. I do hope we will see some reply from someone well before that looming deadline. And to Tom and Michael, when I made my comment (in reply to Tom’s first), I prefaced it with “or” meaning if Adobe might balk at a generic proposal of “the community” somehow “continuing to run it”. I was just proposing a more concrete proposal. I’m open myself to any means to best keep it useful. Eventually, github is a brilliant idea, it reflects the tendency to centralize repos and go with the future proof portals. And I support Charlie absolutely, the projects on riaforge are still valuable for many people, not only for historic but practical reasons. 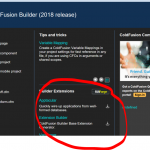 We are the leading swiss survey software provider, using coldfusion, railo and lucee for years, actually from the beginnings, and are very committed to all coldfusion matters. we also offer to take over hosting of riaforge.org for free with all the traffic and features, not only read-only, but also actively, in case, this is what the community wants, in our data center in zürich, switzerland. if this is an option, especially concerning legal point of view, please contact us on info@onlineumfragen.com using the e-mail subject “riaforge.org hosting” (just to prevent spam). If our firm can do the community a favor, we would love to. Makes me feel glad I adopted and adapted Brian Kotek’s formutils. Even so, I wish there was a systematic way to get everything over to Github or somewhere. I wholeheartedly agree that RIAForge is still useful. And if anyone is qualified and should be trusted to archive such a resource, it’s Mr. Arehart. Or they could let someone in the community take over the domain and hosting (while modifying the site to clarify its no longer Adobe-run). I would be willing. And I would propose we make the site read-only, such that no more changes or even comments would be allowed. This way the site would remain for historical value, given all the forum threads and blog posts on the web that may point to projects there. Even some projects that have not been updated in years are still useful (as was demonstrated in Rob Dudley’s talk at cfcamp in Oct on the ubikey USB security device, for which he’d posted code years ago that still worked). There are many other such projects that are still useful. Still, it certainly makes sense to suggest that owners/contributors of actively edited projects move them to github, and then a pointer to that github project could then be added on respective riaforge project page (the only edits that would be allowed on the riaforge site). The old comments and other non-code content for the project could remain–for posterity, again in read-only mode. And heck, the riaforge site code itself could be moved to github also, to allow community contributions in managing it (though being a read-only site, that’s not really as necessary as it would be if the whole site was continuing to evolve). Again, I’d be willing to take on the hosting and above mods, for the sake of the community and for the value of those useful projects still there, especially where the original maintainers of a project are gone–or may not be motivated to push the project to github. If the site vanishes instead, all that code and content (not moved to github before then) would vanish with it. And I or others who might only USE some project might still be motivated move to MOVE some project to github, if only to improve its exposure. What do folks and Adobe/Rakshith think? BTW, before anyone is tempted to refer to this as “another example of Adobe showing a lack of interest in CF” or worse, “another nail in the coffin for CF”, I would argue it’s just a reasonable step in evolution of code-sharing sites, most of which have moved to central code repos (even Google code and ms codeplex repos have closed down in recent years, in favor of github and others). Why don’t you let the community continue to run it ?